Experience one of the exhilarating experience of Jet ski and feel the speed at one of the prominent beaches of Goa - Dona Paula beach. If you are in Goa, then you cannot miss the watersports which Goan beaches are famous for. Jet Ski is one of the water sport where you feel the speed while on waters. You will have an instructor to guide you about how to ride and safety measures are also being told. It is compulsory to wear a life jacket while riding jet ski, so it is completely safe. Enjoy this most adventurous experience of Jet Skii at Dona Paula beach. The guests are requested to report at Dona Paula beach at the selected time slot. We will meet the guide here and have a quick briefing session about the activity and safety measures. Life jackets are provided for the guests and go for jet skiing with the instructor. Depart with a lot of memories of jet skiing. 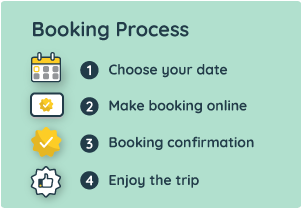 The local person's contact and phone number is shared in the booking voucher which is sent via email.